The Smokey Bear campaign was supposed to teach about forest fire prevention, but some say Smokey's advice has led to more fires. On Wednesday, Smokey Bear turned 73 years old. The Smokey Bear campaign was created in 1944 by the U.S. Forest Service and has become almost synonymous with forest fire prevention. But seven decades later, wildfires are becoming a major problem again. The number of annual forest fires in the western U.S. has nearly doubled since 1984. But Smokey wasn't just about preventing wildfires; the campaign also promoted efforts to contain and suppress those fires. Now, officials wonder if the campaign was too successful. Experts say some fires need to burn for the overall health of the forest. Regular wildfires burn away the underbrush that would otherwise fuel hotter and more dangerous fires if left to pile up. According to the Ecological Society of America, trying to stop or contain all wildfires has changed the makeup of U.S. forests. They say that has made wildfires more expensive and difficult to control. We've seen evidence of this most recently in the 2017 California wildfires. The state has seen almost 1,000 more fires thus far in 2017 than it had at the same time last year. Climate change and other human actions may also increase the number and intensity of wildfires. 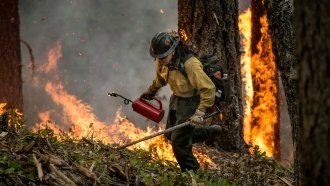 But President Donald Trump is proposing some hefty cuts to wildfire prevention and suppression funding. Smokey Bear made major contributions to fire prevention awareness. But the campaign just may have contributed to current wildfire issues as well.